I created this recipe for pull-apart walnut bread as part of the menu for my penultimate exam for my Cordon Bleu Diploma last year. It is incredibly quick and easy and the resulting bread has a fluffy, soft texture and a slightly sweet, nutty taste. It's very versatile and goes well with a multitude of dishes including carrot soup, cheese boards and goats cheese terrines. Place the dried yeast in a bowl with 75 millilitres lukewarm water and 0.5 teaspoon of brown sugar. Whisk well and leave to one side until the surface has 2 centimetres of froth on it. Meanwhile place the flour, remaining sugar, salt and walnut pieces in the mixing bowl of a stand mixer. Stir well. Melt the butter on a low heat taking care not to burn it. When the froth has developed on the yeast ferment, add it to the mixing bowl of the stand mixer along with the melted butter and 150 millilitres of lukewarm water. Mix well. Use the dough hook attachment on the stand mixer and knead for 3 minutes. NB The kneading can be done by hand if required - the resulting dough should be springy and slightly sticky. Shape the dough as desired. 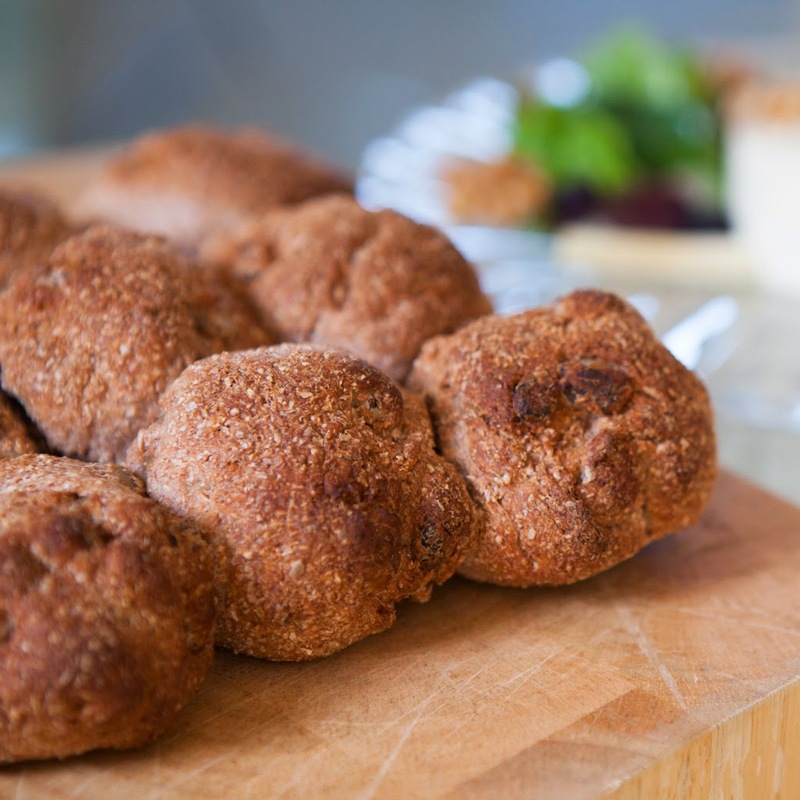 If you wish to make a pull-apart loaf like the one in the photos, split the dough into 12 balls weighing 50 grams each. Place the balls next to each other on a baking tray so that they are just touching. Cover the dough with a clean tea towel and leave to prove until it has doubled in size. This should take in the region of 45 minutes. Pre heat the oven to 230 degrees Centigrade. Bake the bread for 18 minutes. To check that it is cooked, knock the underside of the bread. It should have a hollow sound. Leave the bread to cool on a wire rack. Serve on the same day. Yum!! I'll have to make this, this weekend!! Hi Liz - yes do! It's yum and goes really well with carrot soup or goat's cheese.